Alternative Press is excited to announce our new product line: The Box by Alternative Press! You asked, and we brought it back! 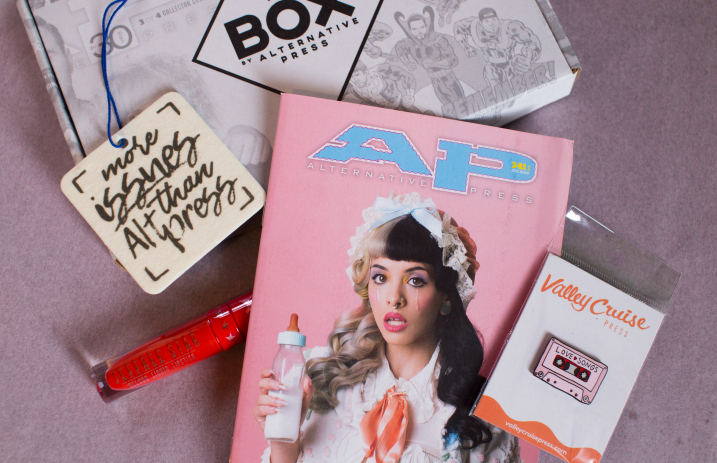 A limited edition reissue of our Melanie Martinez issue will be available only in The Box. This new mini-mag features Melanie Martinez’s first-ever magazine cover story with extended interview content from the multifaceted artist. We repeat: This will not be available in stores. The first release of The Box features Jeffree Star Cosmetics Velour Liquid Lipstick in Checkmate (no longer available on jeffreestarcosmetics.com), one of four adorable enamel pins or a patch from art-centric lifestyle brand Valley Cruise, and our brand new baby powder scented “More Issues Than AltPress” air freshener to keep you car, locker or bedroom smelling sweet! Check out all of the awesome products below! Quantities are extremely limited, so order The Box before it’s gone. As an added bonus, we are offering free shipping on all orders made through midnight Friday (April 28). Plus, if you post your unboxing video with the tag #iamap, you will be entered for a chance to win a signed Melanie Martinez poster.